The day after the mass bombings in Brussels that killed 34 people and wounded another 230, it emerged that Belgian authorities had specific forewarnings of the attack and had already last year identified the men who carried out the assault as Islamist terrorists. The suspected attackers were well known to police authorities. Two of the suicide bombers, Khalid El Bakraoui, who attacked the metro station, and his brother Ibrahim El Bakraoui, who exploded a bomb at the airport, had been convicted of armed robbery and were known to have connections to the November 13 attacks in Paris carried out by the Islamic State in Iraq and Syria (ISIS). Both were identified post-mortem by their fingerprints. Turkish President Recep Tayyip Erdoğan said Ibrahim El Bakraoui had been detained in Turkey and identified as an Islamist fighter, then deported to the Netherlands last year. Another bomber who blew himself up at the airport has still to be identified, and the third airport attacker, identified as Najim Laachraoui, remains on the run. Belgian authorities said they were looking for a man of Turkish origin, 22 years old, driving an old, dark Audi A4 car. These reports raise the most serious questions as to how and why Belgian and allied intelligence agencies allowed the Brussels bombings to occur. In the fifteenth year of the “war on terror” declared by Washington and its European allies after the September 11, 2001 bombings, intelligence agencies have at their disposal sophisticated spying techniques capable of tracking virtually all cell phone and Internet activity. Claims that the attack occurred because Belgian and allied intelligence agencies somehow failed to “connect the dots” are simply not believable. Belgium has been on high alert. 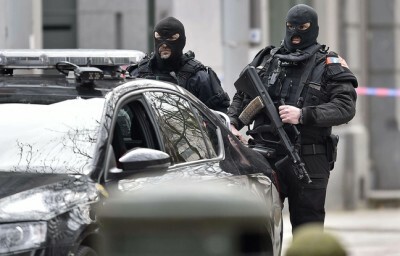 Large numbers of soldiers and police were deployed in Brussels when the city was placed on lockdown following the November 13 attacks in Paris, and again after last week’s capture of November 13 attacker Salah Abdeslam. Belgian forces had advance notice of the targets of an attack and the identity of the attackers. Nonetheless, the ISIS team was able to amass a large stock of bomb-making equipment undisturbed and plan, prepare and execute devastating and coordinated terror bombings. During the first lockdown, in the aftermath of the Paris attacks, 16 people were arrested and 22 searches were made, which produced nothing. All the while, Abdeslam was living a few kilometers from his parents’ home. Police located El Bakraoui’s apartment by speaking to the taxi driver who dropped off the attackers at Zavantem airport. He told police he picked them up from 4 rue Max Roos in the Schaerbeek area of Brussels. Police searched the apartment and found 15 kilos of explosives, 150 litres of acetone, 30 litres of hydrogen peroxide, detonators, a case full of nails and screws and other bomb-making materials. There are as yet no calls for mass sackings in Belgian and European intelligence circles after this stunning breakdown of security. The reason is that powerful factions within the ruling elite and the state, far from being genuinely revolted by these attacks, view them as a political godsend, allowing them to press for policies on which there is broad agreement in ruling circles: stepped-up military intervention in the Middle East, police-state surveillance measures in Europe and incitement of anti-Muslim racism. European officials are holding a conference today to coordinate a broad expansion of police operations across Europe, while Marine Le Pen, the leader of France’s neo-fascist National Front, is calling for large-scale raids against Muslim neighborhoods in France. “We must immediately launch a vast police operation to invest all these districts that are outside our Republic,” she declared. Under these conditions, it is increasingly clear that ISIS serves US and European imperialism not only as a proxy force fighting for regime-change in Syria, but also as an instrument to press for anti-democratic and unpopular policies at home. The ISIS attacks in Paris last January and again in November, and in Brussels this week, were all carried out by the same terror network. This network is well known to French intelligence and to its US and European counterparts. All of these forces are linked to the original Al Qaeda network that emerged from the collaboration between the CIA and Saudi and Pakistani intelligence to mobilize Islamist fighters against the USSR and the Soviet-backed Afghan regime in the 1980s. Khalid El Bakraoui rented, under an assumed identity, an apartment in the Belgian town of Charleroi for the authors of the November 13 attacks as a stop-over on their way to Paris. He also rented the apartment in the Forest area of Brussels, where on March 15 police first encountered Salah Abdeslam, and where Mohamed Belkaïd was killed in a gun battle that allowed Abdeslam to escape the initial police raid. The French news site Médiapart reported that Abdelhamid Abaaoud, the organizer of the November 13 attacks, and Chérif Kouachi, one of the Charlie Hebdo attackers, both knew Farid Melouk, a top figure in French Islamist circles. Melouk was a leading member of the Algerian Islamic Armed Group (GIA), a terror organization linked to Al Qaeda that fought the military junta during the Algerian Civil War of the 1990s. Chérif Kouachi’s meeting with Melouk on April 11, 2010 was photographed, using telephoto lenses, by investigators of the French Anti-Terrorism Sub-Division (SDAT). Arrested with other Al Qaida members in Belgium in 1998 for attempted murder, possession of arms and explosives and falsifying government documents, Melouk was in prison until 2004, when he was extradited to serve a second term in France until 2009. When released, he stayed in France, quietly establishing closer ties to ISIS. He managed to flee to Syria the day after the Charlie Hebdo attacks. Such reports underscore that, over the course of decades, the jihadist networks have been investigated and mapped out in the greatest of detail by the European secret services, judiciary and police agencies.